The official support thread for my products. gscartsw - Pre-orders are open. All orders before 1/29/2019 are here are currently are being shipped. ETA for orders made on 1/30/2019 and later is May 2019, sorry for the inconvenience. gcompsw - I am waiting for the factory to ship me sample RCA connectors with reduced height, as soon as I get them here and evaluate, the pre-orders will be opened. I hope it won't take long. Last edited by superg on Wed Mar 27, 2019 2:32 am, edited 56 times in total. Granted it's 5 connections per box, (with the 6th being there for output) but... It's pretty lossless, automatic and with two of those one can have 9 functional ports and it'll still cost less than 100 bucks (more like 84 dollars going by Amazon, to be fair) . If I was in US I'd look into importing before looking twice this way... again, sorry for pointing it out this harshly. Another point of interest for this forum, right from the bat would be knowing if you're planning on selling it with a RGBS cable option as well as a direct to XRGB-mini cable option. Those could be your selling points tbh, because adapter cables for the mini have to be bought otherwise as do cables for RGBS TV's (PVM/BVM) and PC Monitors who support them. Female RCA's like they would be in done on the PCB and the composite (I've never seen these breakout cables without it) might just save somebody with RGB cables and a light-gun of some sort, I dunno. Scart colored plugs are interesting and shame you don't seem to be able to secure more (red specially) and the regular black ones just seem like they'll go well along a SLG-in-a-box. But doesn't warrant a sale or real interest from me. Last edited by lostinblue on Sun Jul 06, 2014 6:07 pm, edited 1 time in total. Granted it's 5 per box, but... With two of those one can have 9 functional ports... and it'll still cost less than 100 bucks. If I was in US I'd look into importing before looking twice this way. Bandridge is a junk. It's a mechanical switch where every button shorts all 21 or so pins. Not to mention problems with 5th port, PCB / components quality and inconvenient sockets placement. Imagine having 4 daisy chained Bandridges for 16 consoles and piece of paper with 4 numbers encoding to turn on needed console . Another point of interest for this forum, right from the bat would be knowing if you're planning on selling it with a RGBS cable option. As long as there are SCART->RGBS+Audio converters I see no point of making one. And this I plan to offer. Scart colored plugs are interesting and shame you don't seem to be able to secure more (red specially) and the black ones just seem like they'll go well along a SLG-in-a-box. It's simply not manufactured anymore, and it's a pure luck I was able to get a little of old stock. I would like to have more colors, if anybody know where I can try to get some - please let me know. how has it come up to 1600$? That's his price for all the materials for all the units...not a per-unit price. @ superg: Hello, fellow MI RGB fan I read through the thread on Assembler a while ago, neat project. A number of shipments from digikey.com/ebay/etc for prototyping, few wrong components, I'd estimate it around $200, too lazy to calculate. IMHO too expensive $50 shipping of first batch PCB's from China. $378.30 - yesterday's Mouser SCART investment, I want to make sure I'll have some stock of SCART sockets for future, you probably know that SCART PCB shortage problem from my assemblergames forum topic . Faulty components, mistakes, solder, wires etc., I am even not going to count these expenses. 4. A lot of time spent on PCB optimizations, components selection, debugging issues, communications with nice guys who did initial testing with their consoles for me, etc. Well, I don't think anybody who makes money from hobby devices is going to give you such detailed breakout on pricing and things you have to do to make such projects profitable. The thing is that I am not making money from it and it was kinda interesting experience for me. Hi, thanks for kind words! I would love to see a version of this switch with two outputs. At $110 + shipping + import tax + waiting it's not so interesting for me at the moment. Fair enoug hand I know the shortage which I doubt will get any better for PCB scarts, you've inspired me to try things out myself with components! What do you mean by two outputs? You want simultaneous RGB output to two different devices? Which is not a good or ideal solution I insist, but I need to source cables from 4 furniture cabinets and I don't want to have 4 cables per cabinet times 4 going on the back so I'll embed plugs and adapt cables instead (pretty hard to explain, but it'll have a hollow part in the back just so I can pull all the cables to one side, hence no cables in the back), all I care for is RGBS at the moment so 6 cables per console is all I need. Otherwise most of them would be traveling on the back via thick cables to a scart switcher and the rest to a component switcher and/or being hdmi... This way I can get away with an army of component switchers with an extra port for 5.1 audio or something (monoprice carries them although sadly they only switch 4 inputs per unit). Anyway, this to say I don't know much about electronics (PCB printing prices, mostly, although I've looked into them a few months back and they weren't cheap) but I know scart plug components for starters are expensive so $85 doesn't surprise me. Thanks for being so honest btw, you didn't have to share price for the materials but I appreciate you for it. Is it? I never heard they were bad before tbh. Didn't see tests either, but most people seem to be happy with them, those are aren't happy with automatic passive switchers that is. I don't have one because as you certainly understood my solution is turning out to be pretty convoluted at this point. Sometimes I don't really see the end of the tunnel. It has the plus of being easy to plug onto a PVM or something RGBS in the end though. I always hear XRGB-mini people receiving it and then waiting two weeks for the cable to plug euroscart. It's a case of so close yet so far. For my first PVM it was similar, I bought the TV then spent a while without being able to plug anything onto it, more than one month. But that was because I didn't want to pay $30 for a cable. Last edited by lostinblue on Sun Jul 06, 2014 6:43 pm, edited 1 time in total. I'm a new owner of this switch (digitaldiatribe on the Assemblergames forums) and it's a great switch and I actually switched from a Bandridge to use it. The automatic switching works great, the inline LM1881 circuit works like a champ. This is a worthwhile switch in my eyes. Yes. I've got a CRT and LCD in the same room and a switch with integrated splitter would be awesome. That way I could play on the CRT and record from the Framemeister at the same time without any additional cables. But I understand that the demand for this is a lot lower than the (already low) demand for high quality SCART switches. That could be interesting. I switch from CRT to Plasma quite a bit and that currently involves switching cables from one side to the other. I was also thinking 8 inputs is generous but a few people might have setups with more than 8 scarts. I'm not even sure if I don't at this point. (edit: I have eleven consoles that are plugged on with scart cables) so, being able to daisy chain two of these should be interesting as well. 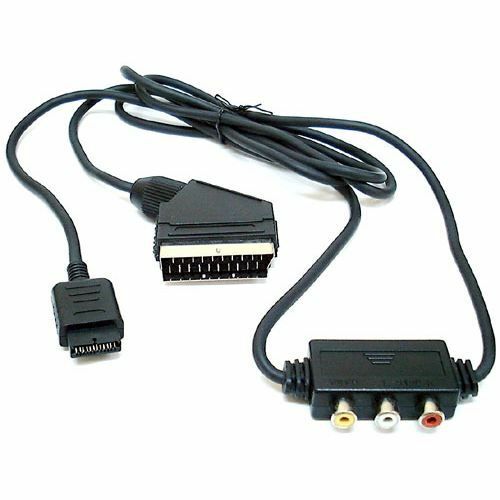 Most people would probably prefer a scart output from the switcher instead of the din one, but I like the 8 pin connector you're using because it's less bulky, I wish regular scart switches used solutions like that even because 5 inputs and one output can get confusing in the sea of cables. I think you nailed it there. But other than scart connector price (which I understand of all things is not even stocked properly) it doesn't really have a reason to be like that, imagine that in a few years someone layman just screws one of those cables and it's not getting manufactured anymore for some reason... he won't be able to build another and curse the device for not having a regular scart output. The way to give it a purpose would be an extra plug (and a 2-way cable being purchaseable) just so it can be daisy chained and turned into a 16-way switcher, or more. Not all units needed to have said plug soldered though. first unit one purchases only needs to output. I know that would make costs rise and we're talking prices already, but... I feel some extra versatility would be what makes it more and more interesting for some. I need to know (and know how bad it is) because I have a image quality thread in a forum on my native language, and before when people wanted to buy switches I'd point those. Granted the alternative are local supermarket ones who sell composite-only passive switchers (cringeworthy) and other regular switchers. Last edited by lostinblue on Sun Jul 06, 2014 7:30 pm, edited 1 time in total. Kinda messy, but I perfectly understand your point. I am still in search of perfect retrogaming room setup and my switch is one step towards it. RCA is better choice for a number of reasons but in this case you have to enforce users to modify all of their cables because SCART is de-facto standard for console RGB. Only small number of people will be willing to do this. IMHO majority of retro-gamers however still don't want to tamper with electronics and rather have plug and play solution, so I have to support SCART . There are issues with 5th input and power (LED's are draining power and diods on power line aren't of high quality from what I know). There isn't much to report on that switch because it's mechanical, picture quality is obviously the same because when you push button it's equivalent to physical reconnecting of the cable, so simple is that. Furthermore if you're using XRGB you don't care about power issues because XRGB doesn't use that at all. So if you don't care about automatic switching and overall case design/inputs count and you're using XRGB - Bandridge is just fine. Was same for me because I didn't want to modify bundled JP21 to SCART. They're still worthwhile for the price if you don't mind having to open it up to cut a trace to have the 5th port work properly because of how it's wired and it's been a good switch to me for the past year I've owned it. But I needed a bigger switch so I could have at least another 2 consoles hooked up and the nearest competitor would have been the Shinybow 6x2 switch is more than the gscartsw (and still be one port short of what I need) or the Keene SCART Commander which in my situation, would command 2 of them and be way more expensive. The gscartsw seems to be in the right niche. 8 inputs is perfect choice because of underlying hardware (every multiplexer has 8 inputs). Daisy-chaining works just fine, it was one of main requirements. Well, it turned out that Mini-DIN wasn't very good idea . MiniDIN->SCART cable is custom, I have to solder it for each switch and it's waste of time. Also there are a lot of good quality SCART->SCART cables, so I am still considering to change it later. Very messy yeah. I honestly get cold feet once in a while, because it's taking a lot longer than I originally envisioned to complete. I'm not modifying the console cables (some of them are original and more than 10 years old, it would feel like a crime), but I am instead doing very short female scart to 6 RCA adapter cables, I buy a female to female scart cable, cut it in half... then wire the important bits to rca... it's a nightmare and I don't even know if I won't have signal loss in the end from all those cables and my soldering (if I do it'll be a nightmare to trace and find)... It's not something I've been recommending to anyone... Or will. But felt I had to explain, I've looked extensively at the price of scart plugs a while back, I never understood why they were so expensive and didn't have a lot of choices going on. I do understand it now (poor stock) and it makes sense because stock also drives price. I see. I thought both used a power supply because I know the automatic one does. Apparently not. Most of the people I've advised with bandridge have been going with the automatic one, but up to this point I would go with the non-automatic myself because I didn't think it warranted the price difference (and I do get up to plug the consoles anyway)... I never thought they would pull a led in a non-wall plug fed unit which now I see they did. That's the equivalent of a schoolbook error for switchers, but probably something which can be fixed by taking the led out, I'll keep it in mind. Thank you for the feedback, I was really afraid for a while there that I had been recommending shite. I didn't knew that shinybow. yeah, I was thinking 8 scart + 1 scart input disguised 8 pin din as a build-to-order option if someone wanted to daisy chaining between units (first unit purchased would never need this because it only needs to output to be linked one that had the input port), but I realized now 9 scart derivation switches could not be practical from a design standpoint. As is, one looses a scart port on one switcher, but I have a lot of crap going on and it's enough for me, I don't know if the difference from 15 to 16 ports makes a world of difference to anyone. Yeah. I still like the idea though. Hey SuperG, As I said in my PM to you over on Assembler I think this is an awesome project, just with the caveat that there's no manual override. Having tested so many switches and consoles over the years I just know this is going to cause issues with someone somewhere. Bandridge is a junk. It's a mechanical switch where every button shorts all 21 or so pins. That's interesting, people seem to believe these switches are of good quality too. Maybe I should order one from Amazon, test it and then just return it. Oh also I think the price is pretty reasonable. I dare bet it would cost you more to cable up something like an Extron Crosspoint and that's the only switch I can think of that has more inputs and is readily available. I have one of these also and I also switched from a 5 port Bandridge automatic. One problem I had with the Bandridge was that they would not function correctly when 2 were daisy chained together. The Bandridge automatic cost about $70 (around what I paid for mine) to import one to the USA and this has 3 more ports and a cable so I think the price per port is about the same for both. Also dont have to deal with getting a replacement power supply for 120v. I'm still puzzled why would anyone need manual switching? Well, I've seen only one manual Bandridge switch, airs from assembler have sent me one for evaluation and to see how does it work inside. Maybe there are other Bandridge switches I am not aware of. Extron is too industrial and overpriced, however I haven't seen it in real life. I have here component 6x2 switch matrix (Impact Acoustics). It looks solid, manual switching. It works just fine, however after looking inside I am not happy at all. Case could be 3 times smaller with such functionality, they are very old tech inside (DIP IC cases, few boards interconnected with ribbons, which I wouldn't do, poor cheapest multiplexers) .That's how they make money. Wow, that was fast, I have only 3 black switches available as of now. Only 1 black switch is left! I don't see how the Banbridge is junk when I can't tell a difference between the direct connection and connection through the box. It's clean and works well (the manual one). To be honest, I would love to have one of yours because it looks absolutely phenomenal, after I save a bit maybe I will buy one (hoping you'll still be making them a couple of months from now). The black one is the best looking one imo. Autodetection is as simple as having some voltage on SCART pin 16, there can't be any caveats. If pin 16 isn't routed - that's cable problem, not switch. 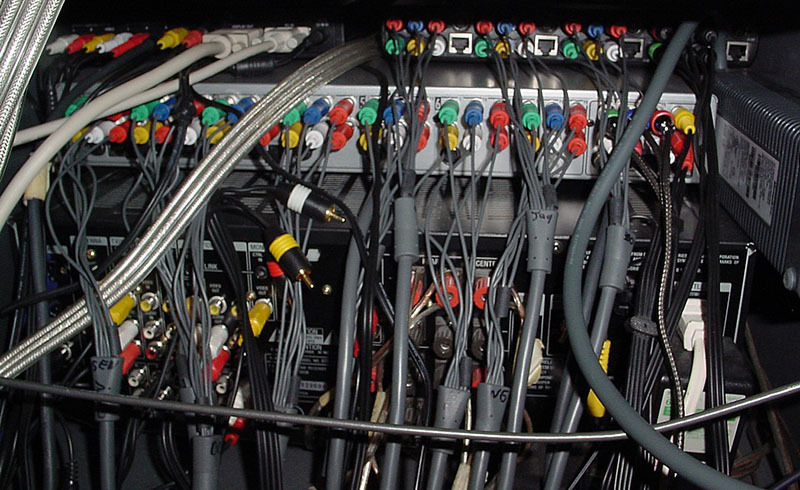 It could be problematic if someone wants to connect a mixture of RGB and Component video sources to the inputs of the SCART switch - the Component sources may not have any means of outputting a switching voltage. Of course it's a rather unusual case, but for me this was the easiest way of adding a Wii into my setup without restricting it to 15kHz modes. How would you use that afterward though if the signal goes into an RGB intake? Believe me there are plenty of cables not wired correctly out there! Yep I'm doing that too. 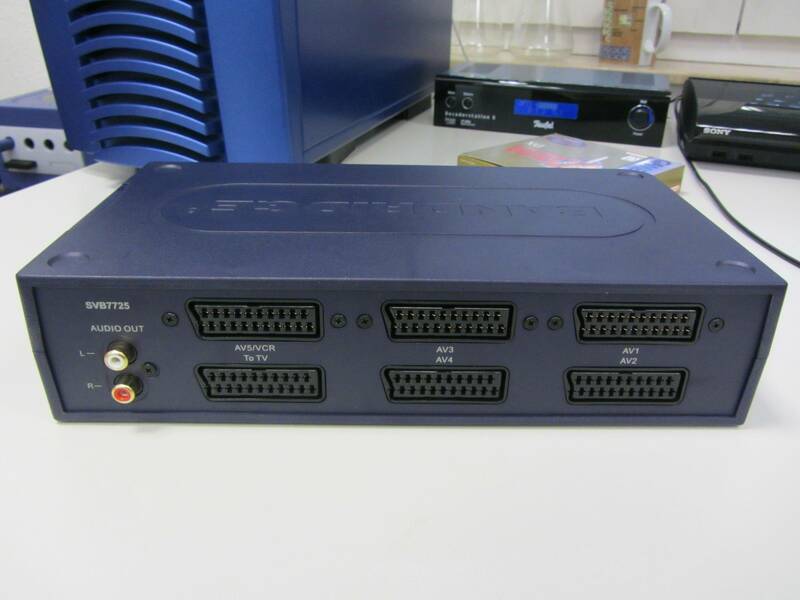 Some processors (XRGB3, DVDO Edge, VP50 for instance) accept component video and RGB on the same inputs. Another way is if you are running your switch into a SCART splitter you can then plug some outputs to RGB and others to component video. I see, which consoles do you use this component signal from?